Do you have a DWI conviction in Texas (or anywhere in the United States)? Are you traveling to Canada any time soon? If you answered “Yes” to both of these questions, you may be in for a surprise at the border. Even if you have recently been acquitted of a DWI charge, you may still be turned away and deemed “criminally inadmissible for entry.” This article will explain the law and provide some solutions if you find yourself in this dilemma. Recently, Canada enacted strict immigration laws making entry into the country by car, plane, train or boat more difficult for United States passport holders who have a DWI arrest or conviction on their record. Regardless of whether the arrest or conviction was a misdemeanor charge, whether you plan to drive while in Canada, or whether the charge happened when you were a juvenile, any DWI charge at all could cause you to be turned away at the border, further damaging chances for success in all Canadian immigration programs for life. Bottom line: travelers with any type of DWI arrest or conviction will face enhanced scrutiny by the border patrol and must comply with additional legal requirements set forth by the Canadian government for entry. It is a better strategy to be proactive and prepared before traveling, instead of reactive and defensive once “caught” at the border. Unlike the division between federal and state powers in the United States with regard to law enforcement, Canadian criminal law is solely a federal responsibility. As a result, criminal laws are uniformly interpreted and enforced throughout all of the Canadian provinces. Traveling to a different province in the hope of more leniency because of different criminal laws will not be helpful. The federal Canadian Immigration and Refugee Protection Act (“IRPA”) governs immigration admissibility into Canada. Section 36(b)-(c) of IRPA states, “a permanent resident or a foreign national is inadmissible on grounds of serious criminality for having been convicted of an offense [or committing an act] outside Canada that, if committed in Canada, would constitute an offense under an Act of Parliament punishable by a maximum term of imprisonment of at least ten years.” Basically, IRPA converts any DWI charge or conviction from the United States into a “serious criminal offense” in Canada and allows Canadian authorities to deny entry into the country at border checkpoints on roads, railways, airports, and maritime ports. Generally speaking, Canada views DWI offenses—even minor offenses—very seriously. However, there are a few options available for travelers who have a DWI on their record. If a traveler wishes to apply for relief, Canadian officials will assess the following: number and type of offense(s), when the sentencing for the offense(s) was completed, and the severity of the offense(s). The three solutions below are the most popular options for relief for travelers with DWI history, however, they are not an exhaustive list of all of the application and appeals procedures, so please consult an attorney for specific details on your particular case. The TRP allows a traveler with a DWI to gain entry Canada on a temporary basis. The permit can be issued for any length of stay, up to a period of three years, and the traveler must state the reason for the visit (for example, family or school). Travelers should apply for the TRP if their most recent offense occurred within the last five years. According to the Canadian Immigration Newsletter, this type of permit may take six months to a year to process. Travelers seeking to permanently resolve their inadmissibility issues can apply for Criminal Rehabilitation. Essentially, the traveler with a DWI charge or conviction is asking the Canadian government to forgive their DWI history. In order to be eligible, more than 5 years must have passed since the completion of one’s most recent sentence (which may have included alcohol classes, counseling, fines, jail or prison time, community service, community supervision, driving courses, probation, etc.). Rehabilitation applications can take a year or more to process. It is possible to have a TRP while one is applying for Permanent Criminal Rehabilitation, so that one has the ability to travel to Canada in the interim while waiting on the resolution of the Criminal Rehabilitation application. If a traveler has only one single DWI conviction where more than 10 years have passed from completion of the full sentence (for example jail or prison time, fines paid, reinstatement of driver’s license, etc), an individual may be deemed rehabilitated by virtue of the time that has elapsed. However, even if you fit this category, it is probably still a good idea to have prepared an affidavit or letter explaining the incident to Canadian border officials because full disclosure is critical to overcoming the barriers to entry. Trying to hide a conviction or denying altogether that you have one are sure fire ways to be denied entry permanently into the country. 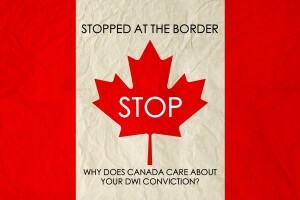 Getting into Canada with a DWI is not as easy as showing up to the border checkpoint with a valid passport and a smile. Don’t be caught by surprise at the border! To increase your chances of admissibility into Canada, it is a good idea to talk with an attorney who will help you take the proactive steps before your trip so that you have the greatest possible chance of gaining approval for entry.